If you have ever made jam before you may have had the problem of getting it to set properly. You might have seen jam sugar or gelling sugar at the supermarket and wondered whether you should be using that instead of normal sugar. The simple answer is that jam sugar will make your jams set easier and a lot firmer. Is it necessary? Let’s take a look at what Jam sugar is and how it helps to set your jam. 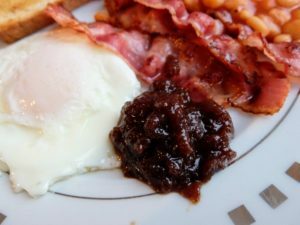 What Is Jam Sugar / Gelling Sugar? What Is Needed For Jam and Jelly To Set? Do You Need Jam Sugar? In the UK it is called “Jam Sugar” in the US “Gelling Sugar” but both are essentially the same thing, sugar with added pectin and citric acid. Sugar, pectin and acid are all required to make jams and jellies set properly. 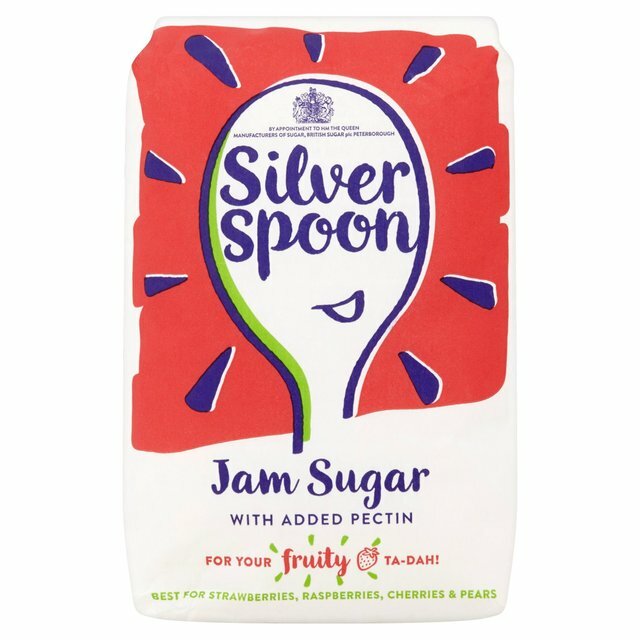 As jam sugars are formulated with the right amount of pectin it means the jams and jellies you make using it set much easier and a lot firmer. Pectin is the key ingredient in how jam, jelly and marmalade sets and gets its firm texture. Pectin is a type of naturally occurring carbohydrate called a polysaccharide that helps maintain the structure of fruit. When you are making jam the pectin in the fruit is released as heat breaks down the cells in the fruit. The pectin dissolves in the fruit juice, as the jam is continually heated the water content lowers and the pectin starts bonding together. These bonds form a web that when the jam cools allows the jam to set to a firm texture. Pectin is in all fruits to varying degrees with some fruits such as apples and citrus fruits containing a lot of pectins, whereas soft fruits like strawberries and apricots have relatively small amounts of pectin. The amount of pectin in a fruit determines how easily it will set, strawberry jam has a tendency to remain looser or even runny for many jam makers just starting out. This is because of the lower pectin content, what is worse is that the riper the strawberry the lower the pectin content. If we increase the amount of pectin in the jam the better and firmer it will set. Jam making sugar or gelling sugar has pectin added which is ideal for making jam with fruit with low pectin content. It is also good for making jam using less sugar. The pH in your jam is largely influenced by the fruit you are using or if you add any acid, for example, in the form of citrus juice which is common in a lot of jam or jelly recipes. 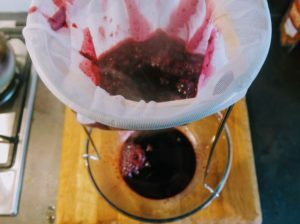 Acid is another important variable in how well your jam sets, of course, we don’t want to make the jam to acidic but by increasing the acid content slightly it can help get a better set jam. There is a little bit of science behind this. When an acid is added to liquid it increases the amount of positively charged ions. Pectin is negatively charged which means it has a tendency to not want to bind with other pectin molecules, this binding is what makes the jam set. Adding an acid changes the pectins charge so it is neutral and this makes it easier for the pectin molecules to join together. This is why jam sugar and gelling sugar have a small amount of citric acid. The acid balances the increased pectin so the two can work together to create a firmer set jelly. Now we know what is in jam or gelling sugar, is it necessary in our jam recipes. I would say in many cases a jam sugar can make the set of a jam or jelly too firm. 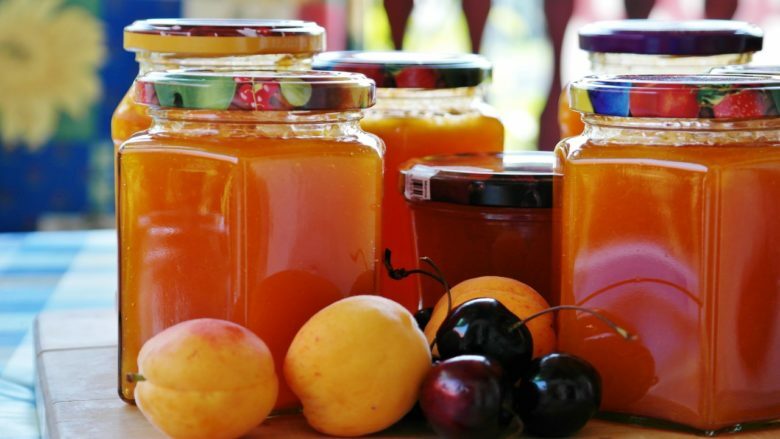 Depending on the type of fruit you are making jam with you can introduce too much pectin, for example, oranges, used to make marmalade, have high levels of pectin and acid which means marmalade sets easily without jam sugar. Fruits low in pectin on the other hand like ripe strawberries are low in pectin and acid so could do with a boost to help achieve a firm set. This chart gives you an idea of how much pectin is in some common jam making fruits. In general soft-fleshed, delicate fruits have less pectin and firmer fruits have more pectin. The most useful tool if you want to be sure you have reached the setting point for a jam or jelly is a thermometer. This takes all the guesswork out of whether or not you have hit a jam setting point. When the temperature of a boiling jam hits 105°C / 220°F you know you have removed enough water from the fruit so pectin can begin forming bonds. There are other tests you can do such as the spoon test, however, taking the temperature really is foolproof. If you are using fruit that is low in pectin it is a good idea to mix ripe fruit with just-ripe fruit. The riper the fruit the lower the pectin content. 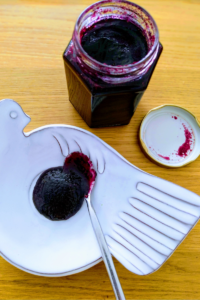 Fruit that is only just ripe contains more pectin so if you can mix the ripeness of the fruits you are using in your recipe you can boost the amount of pectin meaning the jam will set easier. There is a certain art to jam making, the thing is to keep trying. Start out with fruits that you know have higher pectin content and when you are comfortable being able to make these move on to fruits that are trickier to set. Eventually, it will become easy.